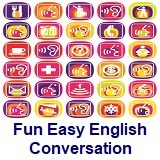 ﻿ Fun Easy English - new classroom free online classes english language lessons speaking listening writing reading april 18. 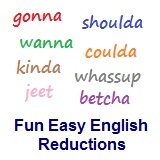 Today in the Fun Easy English classroom you are going to learn "betcha" an American English reduction. Joyce: Shall we take a taxi or a bus to the meeting? Bill: Yes... Oh, oh! There’s a bus now. We’ll have to run to catch it. 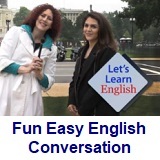 Note there is a rising intonation on taxi and falling intonation on bus in this “or” sentence. Meaning is we ought to…; It would be wise to…. Meaning is the time of day when most people are going to or from work and therefore the traffic is heaviest. In most American cities, rush hour is from seven thirty to nine in the morning and from about five to six thirty in the evening. 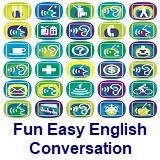 Note that Rush hour is a compound noun, with the principal stress on the first word. 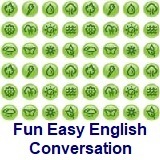 The negative question expresses an expectation of an affirmative answer. 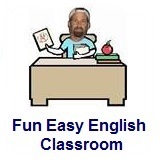 Is a compound noun, with the principal stress on the first word. An exclamation expressing alarm or sudden caution. Note there is a high to low intonation. An exclamation expressing sudden disappointment, shock, or discouragement. Note the emphatic stress and intonation. Meaning is we arrived a moment too late to catch the bus. Meaning is it doesn’t matter; don’t concern yourself.